Escape into the wild in cozy knits and oversized ponchos. ASOS sweater dress and over-the-knee socks, Gentle Fawn poncho, Lack of Color Mack fedora, Timberland boots. Shot by Fashion Goggled in Athens, NY. Last weekend we left the city behind and followed a winding highway North for a wintry country getaway planned by Erica. Our accommodations were quaint and cozy: a cute farmhouse that had been converted into an artist's escape, complete with exposed wooden beams, a wraparound veranda, a wood-burning stove and enchanting little spaces perfect for snuggling up in a blanket to read a book, play a few board games and just find our chill. 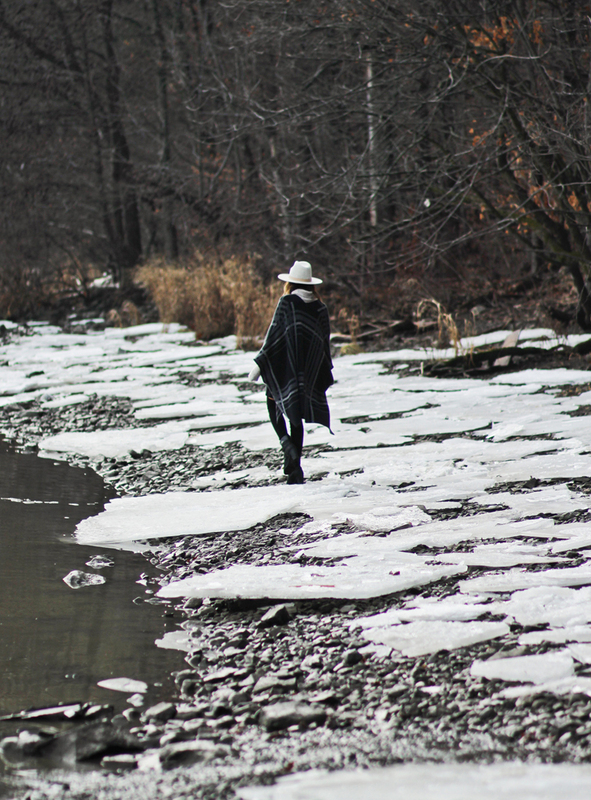 On this particular day, we set off from the house to head on a hike in the nearby town of Athens, braving the slippery, muddy slopes that led down to this pristine, semi-frozen spot on the Hudson river. The sheets of ice lining the shore, paired with the hazy sunlight and gentle reflections, mesmerized us all for a moment. Because, as we know, all good things are wild and free. The next day, as we drove reluctantly back to the city, the first flakes of snow began to fall. i love this whole look. esp loving that sweater dress. beautiful scenery for sure! I love the dress.. it looks so warm and your thigh high socks are darling!